I first saw this green sub in CNN website. It’s a news about James Cameron’s project on exploring the depth of the ocean. Then I Google it to find out more and found out the project is called Deepsea Challenge. 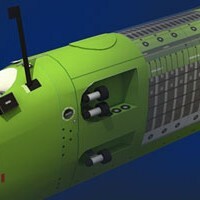 The sub itself is named Deepsea Challenger or DVC-1. DVC-1 was developed secretly for 8 years in Australia. On 25 March 2012 it carried James Cameron to the bottom of the Challenger Deep, the floor of Mariana Trench, the deepest soil on earth known to man. There was no blueprint or technical drawing of this sub around the net, so I had to figure out myself the shape of the sub by using the known height which is 24 feet or 7.3 meters and photos I found on the net. I use 1:35 scale and resulted the model height is around 20 cm, not include its display stage. This sub is unique it is operating in vertical orientation, and that reminds me of a mothership in the famous game Homeworld which has very similar shape and also operate vertically. In this paper model I use 2 type of glue tabs, standard glue tabs and inner glue tabs for assembly the main body. 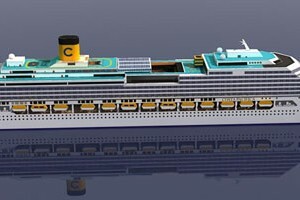 This is Costa Pacifica model, one of 4 luxurious Concordia class cruise ships owned by Italian operator Costa Cociere. They are 4 sister ships, Concordia, Pacifica, Serena and Favolosa. This paper model is very simple and has only a couple of page to print. I use 1:1200 scale for this 24 cm model of 290 meter ship. Few days ago a friend of mine wrote in my Facebook wall, he said "next model will be Costa Concordia". In that time I didn't know what that is, so I Google that words and found out it is a cruise ship that had an accident at sea. I continue search for images of that ship and finally decided to make the template of that beautiful ship as I begin to like creating boat paper model template. I still didn't realize, there are people still missing and found dead aboard on that ship until a couple friend responds on my status on the design progress with disapointment and protest. They were right, I have no respectful motivation to release the Concordia ship, so I change it to Costa Pacifica one of 4 identical ship. I always want to create a boat or a ship paper model but it never come to realization until I made One Piece "Going Merry" ship. Going Merry is a fiction ship and a bit cartoon style, I want a model of real ship. 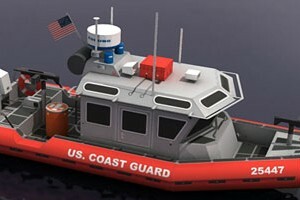 Actually I was planning on making a London red telephone box for paper modeling tutorial, but somehow I saw this US Coast Guard Response Boat Small (RBS),and I thought it would be a good start for my first ship modeling. I made This RBS paper model kit in 1:50 scale or 18 cm in length, it has 3 pages of templates. After the 2004 Indian Ocean Tsunami which killed almost 230,000 people include Aceh province in Indonesia, United States NOAA (National Oceanic Atmospheric Administration) place hundreds of these kind of buoy in the pacific ring and indian ocean. This buoy is a transmitter relay from the seabed sensor below the ocean which transmit signal warning if there's a signs of tsunami trigger earthquake to the NOAA satellite and in the end it will be widely spread to warn people who live near the shore of imminent potential tsunami to quickly evacuate to the save area. 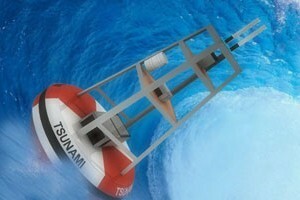 Indonesia also have our own Tsunami Warning System buoy as well as German help for Tsunami buoys in the shore of Mentawai and a long West Sumatra shore, but some of them were already broken or under repaired when the recent tsunami disaster happened (2010). It's very sad more of 400 people are still missing, and the clever governor went to Germany when his people still needs help, very clever. This papercraft is already simplified, only 1 page with 1:35 scale. I think this model might be useful for education.